Preheat oven at 350 degrees F and grease and flour pan (12 or 10 cup tube pan). In two separate bowls, separate eggs yolks from egg whites. Set aside egg yolks. Beat egg whites with a tablespoon of cream of tartar until you see peaks (thicken up). In other bowl, add sugar, milk, and vegetable oil. And lemon extract. Use mixer and mix on medium speed until well mixed. Slowly add flour and baking powder until creamy. Fold in egg whites (do not use mixer). Bake until golden brown – 45-50 minutes. Once cake is done... Shut oven and let it sit in oven with door open for about 1/2 hour. 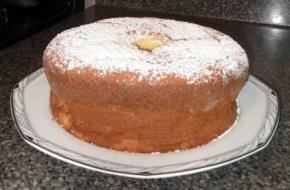 Loosen cake from side of pan and finishing cooling on wire rack. Sprinkle powdered sugar if desired.